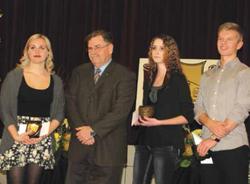 Jan. 15, 2015 2:00 p.m.
Wetaskiwin Composite High School students have the opportunity to earn a wide range of awards and scholarships from a variety of sources including the Province and the community. Each year there is one student who stands out for receiving the most awards, and for the last graduating class this student is Courtney Cook. She received the Academic Awards for highest marks in English 30-1, Social 30-1, Chemistry 30, the Grade 12 Academic Honours Pin, the Governor General’s Medallion, and a Rutherford Scholarship as well as the Fritz Brockman Memorial Scholarship for Excellence in Chemistry, and the Loyal Order of the Moose Award. The other Academic Awards recipients were Samuel Broadbent for Math 30-1, Micheala Greene for Math 30-2, Breanna Gordon for English 30-2, Zack Mageau for French Second Language 30 and Social 30-2, Luke Sather for Science 30, Nakai McDonald for Biology 30, and Ben Ripka for Physics 30. Dianne Ayran and Zack Mageau each received a total of five awards, while Hannah Ballhorn and Tabatha Wallace each received four. There are 44 Community Awards presented, with six of them going to two students. Three awards, including Academic Honours Pins, are presented to both Grade 10 and 11 students. The Community Awards represent a wide range of individual, family, and organizational sources, and recognize a wide range of achievements including academic, athletic, specific trades or career interests, exceptional effort, quality of character, etc. The most accessible scholarships are the Rutherford Scholarships from the Province. Every Alberta high school graduate who averages 75% or more in even one year of high school and goes on to post-secondary study probably meets the requirements to receive a Rutherford Scholarship for at least that year. Since 2008, students with averages of 75% to 79% and continuing their education beyond high school can receive scholarships of $300 for Grade 10, $500 for Grade 11, and $700 for Grade 12. Those with averages of 80% and over can receive $400 for Grade 10, $800 for Grade 11, and $1300 for Grade 12. There is no time limit on application for the scholarships. These scholarships honour Alexander Rutherford, the first Premier, Minister of Education and Minister of Finance of Alberta, and founder of the University of Alberta. Graduates of WCHS received over $66,000 in Rutherford Scholarships in 2014. Congratulations to our students. I look back more than half a century, and recall that every student with an average of 80% or more received a WHS Honour Pin. Personally, I was very aware of the Governor General’s Medal for the Grade Nine Departmentals, because my teacher, Mrs. Mae Blundell, had the reputation of having more of her students win the Governor General’s Medal than fail the exams. This is especially remarkable when you consider that she was the Principal of Camp Centre School (first rural centralized grades one to nine), taught all the subjects, had large classes as much as over 40 students, and had some students come in from one-room schools who were not ready for Grade Nine. Among those unprepared students were ones who told me, “Mrs. Blundell was the first real teacher that I ever had.” and “I don’t know what would have happened to me if it weren’t for Mrs. Blundell. She saw my problems, worked with me and taught me how to learn.” I suspect that there were Governor General’s Medals for Grade 12 Departmentals, too, but there was certainly not one for each high school as there is now. There were few other awards or scholarships. How times have changed! Pictured: Dr. Terry Pearson, Superintendent of Schools for Wetaskiwin Regional Public Schools, with Academic Honour Pin recipients Courtney Cook for Grade 12, Elzanne Venter for Grade 10, and Alex Toohey for Grade 11. Photo by Margaret Chegwin.